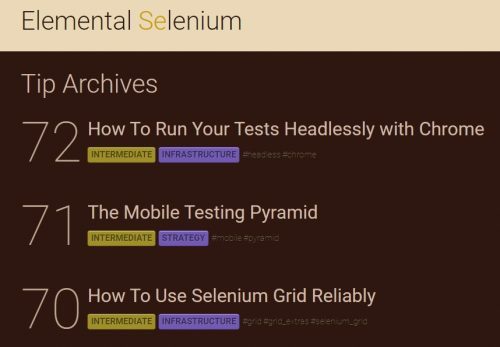 In the list of the already-published tips, you can find topics like “How To Run Your Tests Headlessly with Chrome”, “How To Do Load Testing with J Meter and Selenium” or “How To Slice and Dice Your Tests with Tags”. Each test is classified according the audience (beginner, intermediate, advanced) and tagged for its usage (reporting, continuous integration, etc.). The material of each tips specify the problem and the solution that is discussed in it. An example is provided for the proposed solution.